Accounting Seed is an online accounting platform that is natively built on Salesforce and is designed to accelerate and simplify up all back-office accounting processes. This highly versatile software is implemented in multiple industries including Construction, Healthcare, Software Development, Financial Services, Insurance, Manufacturing, and Non-Profits to mention a few. Accounting Seed features a comprehensive set of tools that enable users to make their accounting tasks all a breeze: Reporting and General Ledger, Revenue Lifecycle Management, Expense Lifecycle Management, Project Accounting, Connected Payment Processing, and Order Management. Users from various sectors note how intuitive and robust Accounting Seed is, enabling them to perform their accounting tasks and more efficiently, even by novice users. It also comes with client interaction capabilities and can be configured to help users address unique needs and demands. Accounting Seed boasts of integrating smoothly with a myriad of popular and widely used business platforms and software, enabling you to utilize multiple systems and perform a number of tasks with a single source of truth as the basis of your action. This helps you and your team do their accounting processes, calculations, and analyses at an optimum level, confident that the results are reliable. Everyone can concentrate on their individual tasks, compare and collaborate their work with the rest of the team knowing they work on the same information as everyone else. Accounting Seed is an extremely versatile software. It offers out-of-the-box configurations to accommodate your unique needs and specifications. To customize the system on a deeper level, you can do so with a partner which comes at an additional cost. You can easily integrate Accounting Seed into your back office processes as well as existing systems and applications. Whatever your requirements are, you won’t find it hard to adopt Accounting Seed and fully benefit from its capabilities and features. With Accounting Seed, you can say goodbye to manual data entry, error-prone processes due to human lapses, and slow, unreliable workflows. Automation makes your processes extremely fast and reliable, providing you with results in real-time to help you become more productive and efficient. What Problems Will Accounting Seed Solve? Accounting Seed eliminates manual processing through automation of tasks and the connection to other programs the company may use or want to use so that the customer does not need to manage spreadsheets and take hours on end to balance. It automates every accounting task under the sun – billing, account tracking, customer/vendor accounts, creations of SOs and POs, sales tax, payroll. reports, etc. The second is broken integrations. 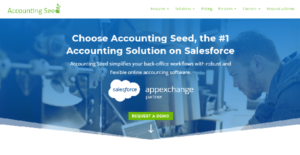 Because Accounting Seed is native to Salesforce, the software can seamlessly connect to all Salesforce products and applications on the AppExchange. The last pain point is an outdated system. Because Accounting Seed is cloud-based, it is updated regularly without any added cost. Developers upgrade the software three times a year (same schedule as Salesforce) to ensure the technology is always up to date and adapting based on any changes in the accounting world. There are trendy and widely used solutions in each software category. But are they essentially the best fit for your organization’s special wants? A popular software application may have thousands of subscribers, but does it offer what you require? For this reason, do not blindly invest in popular systems. Read at least a few Accounting Seed reviews and consider the elements that you desire in the software such as the fees, main functionality, available integrations etc. Then, select a few systems that fit your wants. Check out the free trials of these platforms, read online comments, get clarifications from the maker, and do your homework meticulously. This in-depth homework is sure to aid you select the most excellent software solution for your organization’s specific needs. We realize that when you make a decision to buy Accounting Software it’s important not only to see how experts evaluate it in their reviews, but also to find out if the real people and companies that buy it are actually satisfied with the product. That’s why we’ve created our behavior-based Customer Satisfaction Algorithm™ that gathers customer reviews, comments and Accounting Seed reviews across a wide range of social media sites. The data is then presented in an easy to digest form showing how many people had positive and negative experience with Accounting Seed. With that information at hand you should be equipped to make an informed buying decision that you won’t regret. What are Accounting Seed pricing details? What integrations are available for Accounting Seed?